I realized after reading The Unlikely Pilgrimage of Harold Fry that I enjoy books with older protagonists. They have a different perspective on life and what's important, and it's quite difficult in life to really get to know someone who is of a different generation (besides your parents and their friends), so reading about them is a good way to do so. 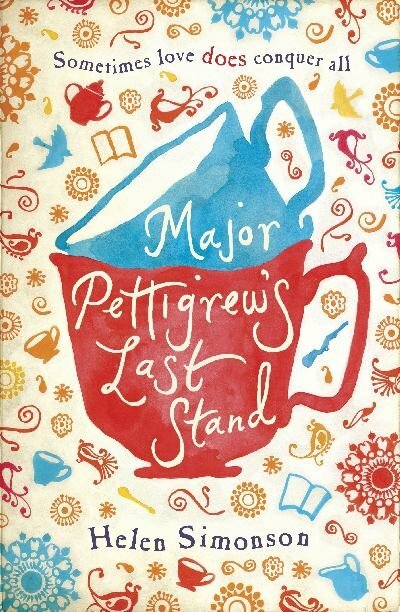 Major Pettigrew's Last Stand, by Helen Simonson, also features older protagonists. There's Major Pettigrew himself, of course, a man probably in his late 60s/early 70s, and then all of his friends and acquaintance, most of whom are middle-aged or older, too. Major Pettigrew's Last Stand is a very popular book, so I am not sure that I have much to add to the discussion that hasn't already been said. Therefore, I'll focus on one aspect of the book in particular in this review - the portrayal of the kind, bumbling but narrow-minded villagers. Major Pettigrew's Last Stand is set in what I assume is a not particularly diverse English village, where the Major has lived for much of his life. There is a Muslim widow, Mrs. Ali, who works in the shop (she is of Pakistani descent, but was born and raised in England) with her nephew. Major Pettigrew gets to know Mrs. Ali after his brother passes away, and the two become fast friends. I enjoyed reading about Mrs. Ali and Major Pettigrew. They were both sensitive, kind, and interesting people with whom to spend time, and I was so happy to get to know them better. I also really liked Helen Simonson's gently mocking sense of humor, in which she picks up on the naive and unconsciously rude things that people say to people of other cultures and backgrounds. I think Simonson did very well with this because she made clear that, most of the time, people do not mean to be racist, but they can say some truly ridiculous things. For example, Major Pettigrew's country club throws a "Mughal Court" themed dinner event. The organizers want everything to be very authentic, right down to the food. The problem is, none of them really enjoys Indian food, so the caterer cheerfully tells them that one of the best fusion dishes is a roast with a side of pudding, and the organizers of the event are convinced that this is the best dinner for them to serve, while also being true to the theme of the Mughal Court. In another scene, one of the Englishwomen says that a train full of chickens is "so authentic," and Mrs. Ali replies that yes, she has never traveled by train without a chicken in her lap. While I think that Simonson went a bit far with her caricatures of people (after a while, it veered away from funny to just ridiculously narrow-minded), I think that the examples she shares are very good ones. Nowadays, you are not made to feel "other" by someone calling you a horrible word, but more by someone insisting that your life experiences have been different than theirs, and that those differences are important. This happens to Mrs. Ali not just because she is of Pakistani descent, but also because she works in a convenience store. Though one assumes that when people say it's strange that Major Pettigrew has become friends with a "shopgirl," what they really mean is that it's strange he has become friends with a Pakistani woman, and they just don't want to sound racist. What also stood out to me was how Major Pettigrew's eyes opened to the situation as his friendship with Mrs. Ali progressed. For example, the last time a club member dated a person of color, he was kicked out of the club. Not because he was with a black woman, of course, but because the black woman was a popular singer, and they just could not have that kind of notoriety associated with the club. Major Pettigrew thought that this was a perfectly reasonable explanation before, and that the whole thing had been done quite well. But as his friendship with Mrs. Ali develops, he wonders if maybe the member had been asked to leave because of his girlfriend's race. I thought this rang true as well. Most people don't realize they are being narrow-minded until they interact with someone who is treated differently and they are able to put themselves in the other person's shoes. Major Pettigrew is not a racist, but that doesn't mean that he didn't say or do racist things, and it's only after he gets to know a few Muslims that this is highlighted to him. Overall, I enjoyed Simonson's novel. While I didn't really think any of the characters besides Mrs. Ali and the Major were fleshed out enough for me to care about them, and while I think some of the drama veered into melodrama, I think Simonson portrayed the situation very well and with enough kindness and humor to ensure that people who read the book and saw themselves would not be offended, but would (hopefully!) be more sensitive in the future. For whatever reason this didn't work for me... I really will have to try again at some point. I agree with all of your excellent analysis. I probably liked it a bit more than you however, maybe because I was so thrilled to see older protagonists for a change! I have this book and I'm really looking forward to it. I like how perceptive the author seems. Oh, excellent. I was looking forward to this and now I'm looking forward to this even more. I liked this one when I read it a while ago, except for parts near the end which were a bit overly dramatic. I couldn't get into this one when I picked it up several years ago. I really like the points you made though. I think films and tv shows often make the mistake of portraying racism as really blatant statements made by people easily identified as the mean villains of the story. In our society, however, it usually comes out in more subtle and veiled ways - as you pointed out with the "shopgirl" comment - and by ostensibly "nice" people. I listened to this on audio a few years ago and I completely agree with your analysis. Really interesting analysis of this book. I'm not sure it's one I'm ever going to read, but I liked your thoughts on it. I love the cover too, it's cute. I expected the other villagers to be even huger stereotypes than they ended up being, so in fact I was pleasantly surprised when I finally read Major Pettigrew. It wasn't my favorite book ever, but it was a nice read. I've wanted to read this with actually knowing what it's about, now I do I want to make it a must-read-soon. The theme you've discussed sounds interesting and detailed, the sort of thing you ponder about for a while afterwards, and I love that.